NHL blackouts can be confusing. We understand. Learn more here. What is a blackout, and why do they exist? Regional blackouts are a mandate of the NHL, designed to cultivate and protect a team’s home market. Every team in the NHL has a number of “regional” games–which are sold by the team to a regional broadcaster and are available only to those in a team’s broadcast region–and “national” games, which are available for anyone to watch from coast-to-coast. Regional blackouts are determined based on your physical location and apply to broadcasts that have been sold regionally, per league or team agreements. The chart below outlines which regional team games can be seen in which region. For example, if you live in British Columbia or the Yukon, you are entitled to watch every Vancouver Canucks game. 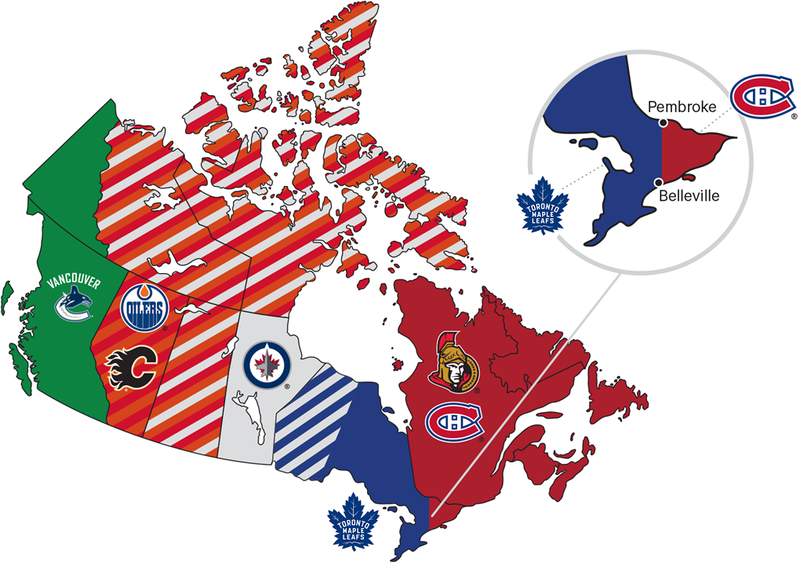 *Note: Sportsnet does not own the regional rights for the Jets, Senators or Canadiens. Only each team’s national games appear in a subscription to Sportsnet NOW or Sportsnet NOW+. Sportsnet is the regional rights holders for the Canucks, Oilers, Flames and Leafs. For the upcoming 2018-19 NHL season, Vancouver has 48, Calgary and Edmonton have 43 and Toronto has 16. In order to watch those regional games, without blackouts, you must reside within the region shown for each team above. All remaining games for each teams are national games. Regional blackouts are determined based on your location at the time you are streaming the content, not based on your billing address. In addition, the use of a VPN, proxies, or other services meant to mask or change your location, may result in you not being able to stream content you normally would be eligible for. Sportsnet does not own the regional rights to the Montreal Canadiens, Winnipeg Jets or Ottawa Senators. As a result, the only Canadiens, Jets or Sens games that are available on Sportsnet NOW are ones that appear during a Wednesday, Saturday, or Sunday night national game. In the structure of the NHL schedule and Sportsnet’s television deal with the NHL, there are certain “national” windows. National games can be watched by anyone, in any location in the country, without blackouts. On Sportsnet, every Scotiabank Wednesday Night Hockey, Hockey Night in Canada or Rogers Hometown Hockey game is a national game that a customer is entitled to watch with the Sportsnet NOW product. There are no regional restrictions for Stanley Cup Playoff games. Every Stanley Cup Playoff game will be on Sportsnet NOW and can be viewed by anyone, anywhere in Canada. If you believe regional restrictions are not being correctly applied in your case, please reach out to nowsupport@sportsnet.ca, and include your postal code, the game you’re attempting to watch and your public IP address, which you can find by going to www.whatismyip.com. NOTE: If you live in the region of one of the Canadian teams and wish to watch the regional games of another Canadian franchise, then Rogers NHL LIVE™ is the correct product for your needs. It allows you to watch all out-of-market games from your given region. Visit ROGERS NHL LIVE for more details.